The most fun one can have in a garden game. When I grew up it was a firm favourite with everyone. Competitive, funny, and serious, it involves strategy, skill, aggression and team work. When played competitively its rules are strict and regulated; in a garden we always played house rules designed around the shape and slopes in our lawn. Comprising four mallets made from plantation grown rubber wood with four coloured balls complete with croquet trolley. 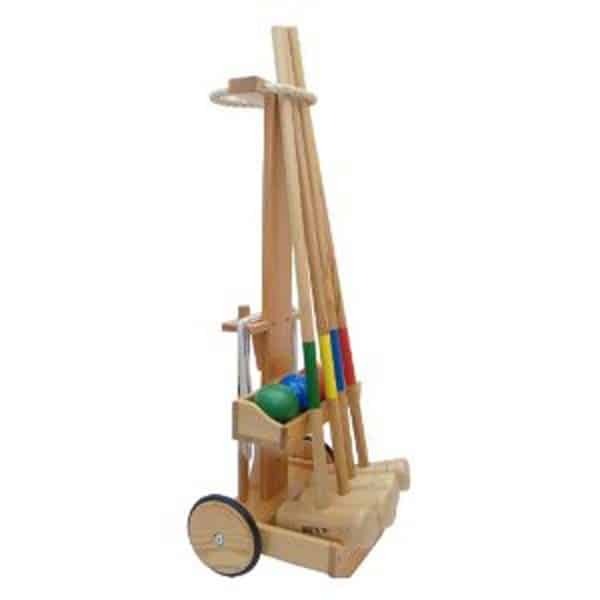 Features 4 Mallets and Handles, 4 Coloured Wooden Balls, 2 Target Sticks, 10 Wickets, Multilingual Rules and Instructions. Warranty 1 year against manufacturing defects on all parts. The game is played by two sides. One side has the black and blue balls and the other side has the red and yellow balls. The object of the game is to advance the balls around the lawn by hitting them with a mallet, scoring a point for each hoop made in the correct order and direction. 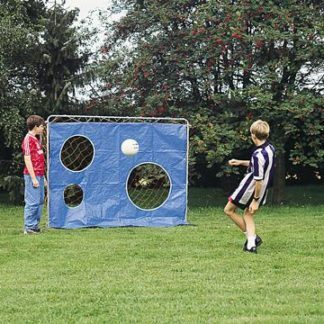 The winning side is the first to score the 6 hoop points and then finish by scoring one peg point for each of its balls. The winning side will therefore score 14 points. The sides are made up of either one player per side (singles) or two players per side (doubles). The rules are the same for singles and doubles. You can earn extra shots in two ways: by scoring the next hoop in order, earning one extra shot, or by striking your ball so that it hits one of the other three balls, earning two extra shots. The sides toss a coin to see who has the choice. The winner of the toss can either choose whether to play first or second. The loser of the toss chooses which pair of balls to choose (red/ yellow or blue/black). There is no significant advantage in whether you play first or second. Play starts from a point a metre in from the boundary in front of the first hoop. The side to go first hits either of their balls into the lawn. When the turn has finished the other side plays a ball from the starting point. You are allowed to gain extra shots (of either kind) immediately. All four balls must be played into the game in the first four turns. For example if red plays first then the next turn is by black or blue. Lets say blue is chosen then the third turn of the game must be played with the yellow ball. The fourth turn of the game must be played with the black ball. When it is your side’s turn to play you must first choose which ball to play. So if you are playing red and yellow, then at the beginning of each turn you can choose whether to play red or yellow. The ball chosen is the only ball that can be hit with the mallet during that turn. A turn consists of a single shot unless with that shot you earn extra shots.